We – the Australian Nursing and Midwifery Federation's Victorian branch– started campaigning for nurse and midwife staffing ratios in 1999 when there was chronic and systemic understaffing in our public hospitals. Workloads were untenable, which was dangerous for patients and staff. This created a Catch-22 effect; nurses and midwives resigned from understaffed wards because they could not cope with the stress of being unable to provide safe care, and hospital management had to bring in expensive agency staff. This meant permanent nurses and midwives were paid less, even though they had more responsibility. Those who opposed mandated staffing levels said it would be impossible to get enough nurses and midwives to meet the ratios – it was estimated that about 2,600 would be needed. What these opponents did not understand was thousands of nurses and midwives on the register were refusing to work because of understaffing. Ratios provided a mechanism to ensure a safe minimum number of staff on each shift, and those 2,600 nurses and midwives – and more – came back. Importantly, ratios gave staff the time to provide safe patient care. Hospital management also reported less sick leave and lower staff turnover. We now have a generation of nurses and midwives who have never known what it is like to go to work unsure about how understaffed they will be. Less time is spent advocating for resources and more time is spent on patient care. Since we secured staffing ratios in 2000, we have had four major industrial campaigns just to hold on to them. 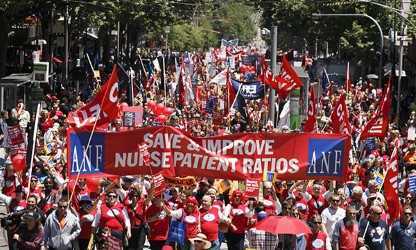 We flooded the workplace with red campaign T-shirts, held community rallies and protests, and walked out of hospitals. This focus on protecting ratios meant it was difficult to reach agreement on other important initiatives, such as measures to prevent violence and the professional development of staff. Now that we have legislated ratios we are doing all these. The development of ratios has helped create a robust, stable workforce and prevented a health service crisis from getting much worse. We have regional pockets where it may be difficult to recruit and retain some clinical specialties, but we don’t have a chronic, state-wide shortage. If a hospital cannot meet the ratio, it must close beds. Nurses and patients are protected. Those opposed to ratios claim, incorrectly, that they are a blunt instrument that does not take patient acuity into account. The ratio in Victoria mandates a minimum number of nurses or midwives, not a maximum, so managers can use their judgement to allocate a patient load for the shift depending on acuity. The state of Victoria’s ratios was part of a landmark decision by our independent industrial umpire, the Fair Work Commission. Commissioner Wayne Blair found that hospital managers who claimed there was no nursing crisis were in denial. He also found evidence of a one-way flow of communication from the top down, which made it difficult to raise issues about understaffing. Once the nurses and midwives started coming back, we introduced restrictions on the use of agency staff. Hospitals had to develop and use nurse and midwife banks for most planned and unplanned leave, resulting in more harmonious working environments and staff who were familiar with the workplace. Our ratios had previously been included in workplace agreements we call ‘enterprise bargaining agreements’, which outline all wages and conditions. To end the campaigning necessary to protect ratios, the Victorian government, led by premier Daniel Andrews, legislated our staffing levels in public hospitals in the Safe Patient Care Act 2015. This provides periodic opportunity to improve the ratios, and we have made a claim to extend them and introduce new ones. We are expecting an amendment to go to the Victorian parliament later this year. Our health system is governed at state rather than federal level, and other states such as Queensland and New South Wales also have ratios. We hope more will follow. We are also campaigning strongly for the introduction of nurse and carer-to-resident ratios in our private and not-for-profit nursing homes. There is a push back from the companies that make large profits in this sector, but minimum staffing levels are as essential in aged care as they are in child care.